Shelburne, NH – It’s time for the twenty ninth annual Wildman Biathlon, one of the toughest multi-sport events in New England, is scheduled for Saturday, August 12th at 8:00 a.m., rain or shine. Calling all runners and bicyclists to shift their training schedules into high gear and get their registrations for this event. Athletes from all over the United States, Canada and some years even other countries, come to New Hampshire’s White Mountains to compete as an individual or as teams in the Wildman. For twenty-nine years, athletes have been challenging their endurance amid some of the most spectacular scenery in the Northeast. 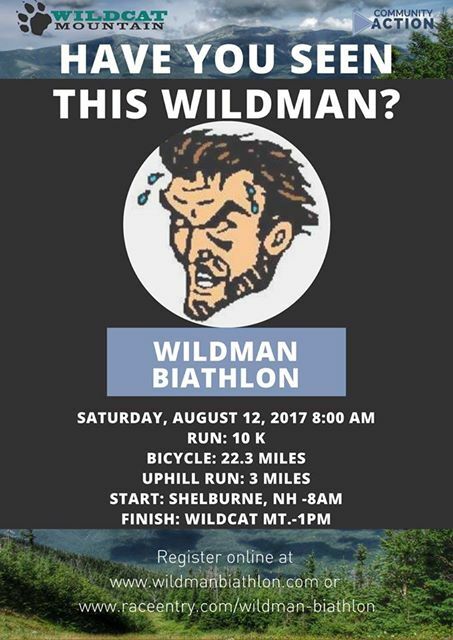 The Wildman Biathlon consists of a 10-K run in the picturesque town of Shelburne, a 22.3 mile bicycle trek through Gorham towards a 3-mile hill climb up the Polecat ski trail to the finish line at the panoramic summit of Wildcat Mountain, a presenting sponsor, located in Pinkham Notch. The race begins with a shotgun start at 8:00 a.m. The winners usually cross the finish line about two hours and fifteen minutes later. Though many individual competitors complete the entire race, many others choose to combine their abilities as two-person and three-person teams. The entry fees for the 2017 Wildman Biathlon are $55.00 for an individual, $110.00 for a two-person team, and $165.00 for a three-person team. This price goes up by $10 per person after July 31, 2017 and entries received the 11thand 12th of August are an additional $25 per person. We now have on-line registration at our new webpage www.wildmanbiathlon.com. The entry fee includes a limited edition Wildman T-shirt, a ride down from the summit on the Wildcat Mountain Scenic Gondola, a support person Gondola ticket, and one meal ticket for the “après-race” meal. Additional meal tickets and Gondola tickets are available for purchase at registration if needed. Categories are available for all ages and team configurations. Overall and Category winners receive commemorative awards, and numerous other prizes are awarded through random drawings. The Wildman Biathlon is a fundraising event to benefit Coos County RSVP, a program of Tri-County Community Action Program, Inc. RSVP matches individuals age 55 and older with volunteer opportunities at non-profit and public agencies in their communities. Our corps of 375 volunteers gave more than 57,000 hours of service at 67 sites throughout Coos County last year. Through a variety of service roles, these volunteers are helping to meet community needs. We’re looking forward to a banner year which brings hundreds of people to our area to experience the hospitality here in the Great North Woods. Visit our webpagewww.wildmanbiathlon.com to view information about the Wildman and our sponsors. For more information about RSVP or how you can become a sponsor, contact Nancy at 752-4103 or e-mail rsvp@tccap.org, view our program webpagewww.cooscountyrsvp.org or write to Coos County RSVP, P.O. Box 3, Berlin, NH 03570.